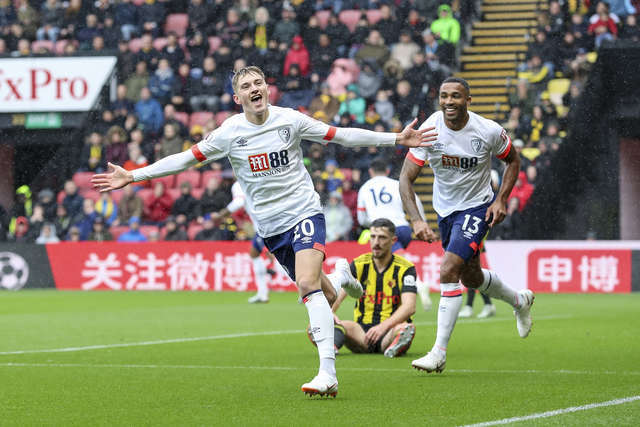 A stunning attacking display saw AFC Bournemouth claim a record Premier League away win in a 4-0 victory on Watford turf. In driving rain David Brooks scored his second goal of the week as he rounded off a free-flowing Cherries counter attack to hand the visitors a 14th-minute lead, the advantage was doubled when Joshua King scored the penalty he had won himself, Watford's Christian Kabasele sent off in giving away the spot kick. King headed home a third before half time and the Cherries further pushed home their numerical advantage just after the interval as Callum Wilson added his name to a lengthening scoresheet. The under-manned hosts tiring, Bournemouth pushed forwards for a fifth before the end, the visiting fans joyously cheering their side all the way to an away success to eclipse the previous marks secured at Swansea City and Chelsea. Bournemouth retained an unchanged side from their win on Monday night, the rain bucketing it down in the hours ahead of kick-off and as the teams took to the field at Vicarage Road. Kitted up in the white and navy blue away strip, the Cherries twice looked to slip balls in behind during the opening exchanges, the greasy surface taking the ball marginally away from the strikers on both occasions, the sides were having to get to grips with the challenging conditions. However, despite a spell of pressure from the hosts, it formed a prelude to a wonderful break and the Cherries taking the lead. Hughes had a shot blocked for the Hornets and as quick as a flash Ryan Fraser was galloping forwards, threading a ball through for King bearing goalwards from the left. The ball across was connected with from seven yards by Callum Wilson and while Ben Foster somehow saved the first effort, Brooks was on hand to finish calmly pass the follow-up past the flailing defenders into the net. The hard work was soon almost undone as Craig Cathcart headed wide when free at a corner, though the Cherries were clicking in attack and could have had their second when Brooks' cross was headed wide by Wilson. Speedy in attack again, the Cherries carved out another pivotal moment when King raced into the area and was fouled by the already-booked Kabasele, referee Jon Moss pointing to the spot before issuing a second caution and then a red card to the Watford defender. Unfazed by the commotion, King stepped up and dispatched from 12 yards in identical fashion as he did at the same venue in late March, again coolly tucking home to the right and sending the 'keeper the wrong way. There was still time for more ahead of the interval for the visitors, who netted a third right on half time. Brooks' ball to Wilson beat the offside trap and the striker stood up a delicate ball from the apex over the last Watford defensive head and onto King's; the Norwegian's header back past Foster and in for a Cherries third. The half-time break took little sting out of the Cherries' tail and they had a fourth within minutes of the restart. Fraser's cross was met by Wilson, his first touch lofted the ball over the 'keeper and with his second he stabbed home virtually from on the line, putting the away side 4-0 up. Nathan Ake's header from a corner was saved by Foster as Bournemouth threatened a fifth, ahead of the pace in the game understandably dropping. Watford's set pieces were causing a constant menace but Begovic repeatedly displayed impressive handling given the conditions. King had a low shot saved by Foster, gaps understandably appearing in the Watford defence as the final whistle came in sight. The advantage remained at four as the referee blew his whistle for the final time, a clean sheet claimed to add further muster to a fantastic away result and performance. With the heavy rain inevitably affecting the play from the start the team adapting to the conditions first were always going to have an advantage; and while the Hornets had the better of the early possession they were undone by the slickest of Bournemouth counters. The first goal will have given manager Eddie Howe special pleasure, two perfect passes carving the home defence open and setting up a goal that set the Cherries away in a stunning first half, the following two goals before the break also showing speed and a ruthlessness in the final third as the Cherries pushed home their advantage. A year ago and after eight Premier League games the Cherries were stuck on four points and sat penultimate in the top flight standings. Fast forward 12 months and Bournemouth are 12 points better off and have scored 12 more goals to sit fifth in the table, overnight at least, the display at Vicarage Road a high-point in a campaign that has already seen five wins recorded, a mark not reached until New Year's Eve in the 2017/18 campaign.